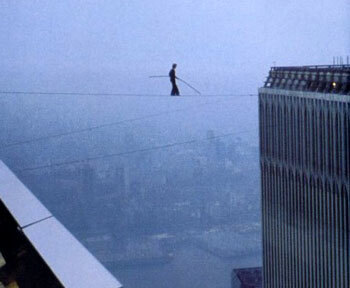 Man On Wire made me very sad. The movie was good, but there was a much more interesting story in there – the story of how a boy/man’s friends let their lives be consumed by the boy/man’s passion and their love for him even as he saw them as mere means to an end. Phillipe struck me as a sociopath who lives for the wire because nothing else causes him to feel. I met him after a screening of the film and would say that those insights into his character are very accurate. He’s a showman and seems to care very little whose toes he steps on to get what he wants in life. But then you’d have to be a little inhuman to want to accomplish such incredible feats of the imagination in the first place.